I’ve been using the L’Oreal Ever Riche range for a while now, to the point where I’ve already repurchased the duo and still not mentioned them the blog. 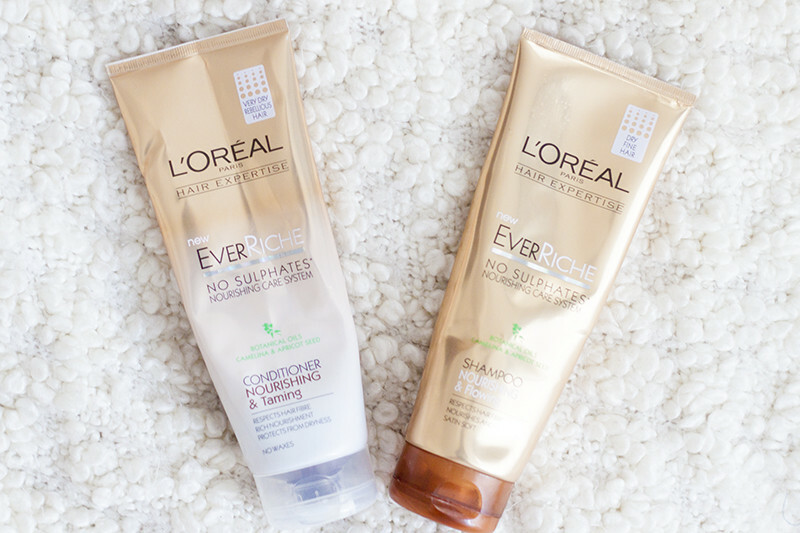 Over the past few months, the L'Oreal Ever Riche Nourishing and Taming Shampoo and Conditioner has quickly become somewhat of a blogger darling. So naturally, the blogger hype machine fires up and I inevitably give in and purchase it as well. First up, I adore the scent, its sort of peachy, coconutty, vanilla-y and fresh. I like that it doesn’t smell too synthetic either. I can’t usually use scented hair products as I have a sensitive scalp, but I’ve experienced no problems while using Ever Riche. The shampoo and conditioner are also Sulphate and Paraben free which is suitable if you're conscious of things like that. I'm not really, but I know it's something a lot of people look for in haircare. The Ever Riche range has been formulated to combat dry to very dry unruly hair. I found that the Shampoo and Conditioner work wonders on my dry over processed hair. They remind me a little of the Redken All Soft Range as they leave my hair feeling, light fluffy and nourished without without it down or feeling coated. My only compliant is that it leaves my hair a little TOO soft which in turn makes it hard to style. I’m never happy am I? I also like the squeezy packaging, and I don't have to spent ages slamming the bottom to get all the dregs out. Plus I found with this little went a long way and I didn't have to use a huge amount to give good results. Sometimes with low end haircare I pile of the product in the hopes of it working better, but it's best to stick to a small amount for this one! I might actually looking into the amounts of hair products you're supposed to use for a future post..
Sending its stockpile every single time a purchase report arises, Pandora Music Radio Official as well as your gadget's mobile strategy.